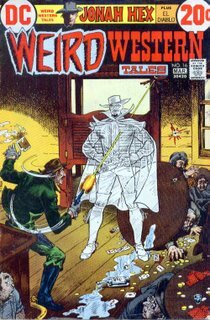 Matching Dragoons: Weird Western Tales #16 "Grasshopper Courage"
Weird Western Tales #16 "Grasshopper Courage"
John Albano, story - Tony DeZuniga, art - Nick Cardy, cover. Jonah's story is the backup feature with the lead story & cover being handled by El Diablo. Jonah rides into town, asking about two men that might have ridden in. A fella reading a newspaper smarts off to Jonah & Jonah slowly walks up onto the porch & kicks the chair out from under the man. The guy starts threatening Jonah until he learns his identity and then politely answers Jonah's question. Jonah walks down the street towards the barber shop where the men are. They come running out, guns blazing but Jonah dives to the ground, fires two shots & kills both of them. 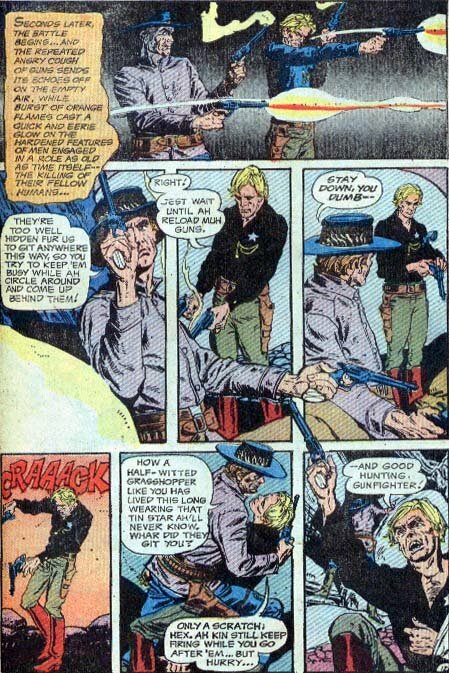 The sheriff shows up & levels his rifle at Jonah, who knocks it out of his hands and draws on him. Jonah explains who the dead men are and then goes to the hotel to get some sleep. Meanwhile a bunch of townspeople gather to complain to the sheriff that he is doing nothing to stop the Scorth Donnigan gang. The shreiff explains that he needs a few deputies. The people aren't buying his excuse & give him 48 hours to bring that gang in or they will elect a new sheriff. The next morning, Amy Gauwell, the shriff's fiance, tries to hire Jonah to help the Sheriff catch the Donnigan gang. Jonah will have none of it until Amy tells him she will pay $500 (that's about $7,000 in today's money). Jonah then happily takes the job. Jonah tags along with the sheriff. A few hours later they ride up to an 'oasis' saloon and question the owner. The owner denies seeing anybody and after Jonah & the sheriff leave, the owner explains to his young son that you should never give information away for free. Jonah is standing in the doorway, overhears his confession of the lie and then throws the man through the front window & proceeds to hang him for lying. The man confesses that he has seen the Donnigan gang that day. Jonah & the sheriff track the gang down and Jonah shoots one dead. They both get into a heated gun battle with the gang & the sheriff gets shot. Jonah sneaks up behind the rest of the gang and shoots the remaining three but ends up stuck in quicksand. The sheriff shows up and has Jonah drop his guns before he will rescue him. Once he rescues Jonah, the sheriff confesses to being in with the Donnigan gang. He takes the money and starts to ride off, mentioning a cute senorita south of the border that is waiting for him. Just then , one of the gang, with his dying breath, manages to shoot & kill the sheriff. Jonah takes the bodies back to town & tells Amy that the sheriff's last thoughts were of her. No mention is made of the money, but Jonah is said to be heading for Mexico. There is no mention of any dates, but Jonah is wearing the black hat he acquired in #14, so it is probably around 1867. The story is good and DeZuniga's art literally seems to move all over the page. Almost every page has someone that can't be contained within the borders of each frame, the best page is here. I'm not sure how often quicksand showed up in the old west, but it was pretty convienent this time. Jonah ends up tangling with quicksand years later down in Brazil. Next Issue: Dynamite, shootings and wheelchair death!! !